I have less than one week before my flight back to the US, which I'm still wrapping my mind around. This year has taught me much and pushed me in ways I could have never expected. Yesterday was my last Friday at Itipini, and I got to spend time with some of my greatest teachers. On Fridays after the clinic closes, high school students from the community come for Study Skills sessions. Over the past several months a "regular crew" has formed, and we gather to talk about what's going on in school, at home, and to work on homework together. I'm grateful for our time together and look back happily over our mutual growth. Starting back in November with the help of Ben, who was a fellow volunteer at Itipini for three months, we began meeting on a regular basis. Megan Berry was also a huge help in tutoring, working with local schools, and reminding us all to have a good sense of humor. Awkwardness around language barriers and my inability to remember trigonometry surrounded many of our first gatherings. Since then, we've come to know more of each others' stories. Many of these kids have less than ideal home situations and attend schools lacking in resources. Siziwe (pictured below) and her sister Khayakhazi are attending 11th and 12th grades respectively. This year they have lost both of their parents to AIDS and tuberculosis. They now care for their younger brother along with their own children with the help of neighbors. The pain and loss they have experienced this year is great, and their responsibilities have jumped tremendously. However, they are working to not let this pain define them, and continue showing up. Drop out rates in the Eastern Cape are staggeringly high, and this certainly rings true in Itipini. Home environments not conducive to studying (no electricity, no running water, lack of privacy, sometimes little or no parental support) and school environments that are also challenging (few textbooks, teacher-less classrooms, no school transport, socio-economic discrimination) make the path to passing the matriculation exam in twelfth grade a daunting task for many. Figuring out how to best support and encourage our students has been a challenge, and I think in many ways it is about showing up. Showing up on Fridays to provide a space for them to work together on homework. Showing up at school to talk to their teachers when a parent has died. Showing up when they come to me with a problem at home or school, and listening. They have taught me this through their own living examples of continuing to show up--at school, on Fridays, and to responsibilities at home that are many. Consistency and presence are sometimes all we can offer, but that is a great gift. They return that gift to me by continuing to come on Fridays, and by sharing their joys and sorrows during the week. These young men and women have been some of my greatest teachers this year, and I am humbly thankful for our time together. They have taught me the importance of showing up and not giving up, and that has been a great, great lesson. Elsa, Nonzuzo, Vuyelwa, Elsa, and Nomxolisi work together on filling in a job application. Getting to know some of the young women of Itipini has been one of the highlights of my time here. I've seen our relationships grow overtime, and appreciate our conversations about music, family, politics, Mthatha, and about struggles in our lives. A major one for all the young people I've met during my time here is how to get into university and where to find work. The unemployment rate in South Africa is around 25%, with the latest figures showing rates of 26.9% for the Eastern Cape (as reported by Statistics South Africa at www.statssa.gov.za). Much of the world is feeling an increase in job loss and financial constrain, and that is certainly felt in our community at Itipini where a majority of the residents are unemployed or semi-employed. Working with community members to find positive outlets to use their time and skills is a daily struggle experienced at the project. Many times factors such as level of education, children, transportation, and work experience make it difficult for Itipini residents to find work. Alcohol and drug usage impacts, either directly or peripherally, a majority of families living at Itipini who have members looking for work. Plus, numerous community members have shared with us the ways in which they face discrimination and judgment from potential employers who do not wish to hire them simply because they are living at Itipini and the reputation that connotes. Looking for work is rarely easy, however looking for work in Mthatha seems like a Sisyphean struggle to many. 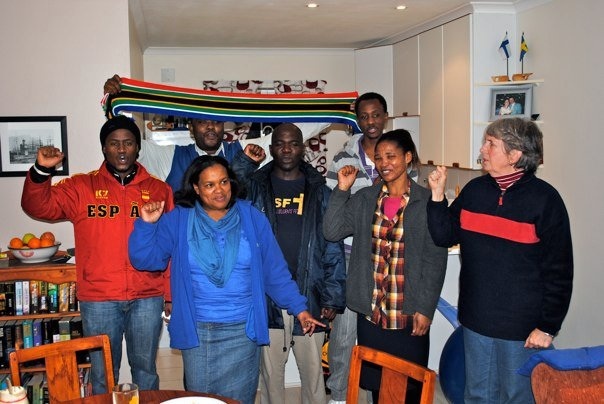 It had been in the works and the subject of heated discussions all year, but following Easter, "Team South Africa" finally set out on a roadtrip from Cape Town destined for the Eastern Cape. "Team South Africa" is composed of the four YASCers living and working here this year--Amanda, Ann, Travis, and myself. Amanda and Ann both live in Cape Town where they work for HOPE Africa and with Anglican student ministries, respectively, and Travis is based in Grahamstown where he serves as an assistant teacher for students in Grade R (kindergarten). As a group we had hoped to find time during the course of the year to get together for a trip of some sort, and with a slew of public holidays lining up at the end of April we set our dates! We decided to make our way from Cape Town to Mthatha driving along the Garden Route, which is a popular section of the southern half of the country because of its varied landscapes and interesting stopping points along the way. We would also have the opportunity to spend time with one another in our various sites and get a glimpse of what life, work, and play is like in each of our placements. I flew to Cape Town on Maunday Thursday, and was able to share in the rest of Holy Week with Ann and Amanda in the Mother City. It was a real gift being able to spend these days with them, and wonderful to take part in services at St. Faith's where Amanda has been serving as a deacon since early April. Travis flew into Cape Town on Monday April 25th, and we began our 1,000+ kilometer journey toward Mthatha. That afternoon we wound our way along the coast to our first stop in Cape Agulhas. The two-lane highway just outside of Cape Town hugs the rocky coast and was a stunning start to our trek. Cape Agulhas is the southernmost tip of the African continent, and we arrived just in time to catch the sunset where the Indian and Atlantic Oceans meet. We spent some time walking out amongst the rocks and taking in the cool night air, and then headed into town for dinner. We spent the night at Cape Agulhas Backpackers which had warm fireplace to greet us. It was also an ideal spot for catching up with one another celebrating the start of our adventure. Tuesday morning we headed back out to The Tip, and visited the lighthouse that sits on Cape Agulhas. It's the second oldest lighthouse in the country, and making the steep and very windy climb up to its beacon is worth the views of the two oceans below. We then drove down to a shipwreck that sits just off the coast where we could see the power, both beautiful and haunting, and that the waters hold. We piled back into our trusty Nissan Tilda bound for our next stop in Plettenberg Bay. We detoured off of the N2 for a little while to wind along the R62. This road took us through mountains and arid stretches that contrasted with the rocky edges of the coast and fertile fields that we passed on our first day. In Plett we stayed at Acacia B&B, and settled into our first night there following dinner at a restaurant for the "young and hip" that Lesley our hostess suggested...see picture below for evidence of our young and hip-ness. Two thumbs up. Wednesday we kept in local and explored the sights around Plett. We visited Bramon Wine Estate in the morning and tasted some wonderful wine at this family run establishment. Bramon also has a restaurant that sits out among their vines, and we enjoyed a lunch that was just wonderful. The tappas style menu allowed us to try LOTS of yummy dishes, and we all left full and happy. After Bramon, we paid a visit to Monkeyland and Birds of Eden which lie just up the road along a stretch known as the Crags. This monkey and bird sanctuary provided us with some up close encounters of furry and winged creatures. We also were able to spend some time sitting by the water in Plettenberg Bay, which is one of the most popular coastal destinations in the country. That evening we enjoyed another dinner in town, and rested up for our next stop. Around lunch we headed to Storms River Mouth, where Storms River meets the Indian Ocean. This was hands-down my favorite stop of our trip. The color of the water, the mix of mountain and coastal landscapes, and the beauty of this national park were amazing. The park's restaurant sits just over the edge of the water, and it was a stunning place to enjoy a meal. We then took a hike over to the mouth of the river, which can be crossed via a trio of suspension bridges. Along the ridge of one of the mountains we saw a lookout point, and somehow or another we decided to reach it. Our leisurely walk soon turned into a full on climb, but we made it and basked in our triumph (i.e. caught our breath) once we made it. We stayed up there until the sun started to set, and then headed back to Djembe Backpackers where the night took a turn toward the surreal. At Djembe, we grabbed a drink and then settled into a circle that was forming around the fire. There was a small group of middle aged South Africans, who were in town for an Elvis Festival. Yes, an Elvis Festival. In Storms River. In a fifties themed dinner called "Marilyn's." Yep. As the night progressed, other folks joined us...some from Germany, more South Africans, and later a group of Americans. Eventually we convinced Alan , who is an Elvis impersonator competing in some of the festivals competitions, to bring out his karaoke gear. Speakers were set up, mics were tested, and soon "Mojo" and "Love Me Tender" were being croned into the night air. Others joined in, some ABBA and Garth Brooks tunes were busted out, and we all sang along under the stars. Surreal and wonderful. Friday we said so long to Storms River, and made our way to Grahamstown (aka Travis' stomping grounds). Along the way though we took a detour into Addo Elephant Park, where we spent a few hours driving around with them earthly giants. We rolled the windows down to listen and watch as they stood just feet from us. They are humbling beings that fill me with wonder every time I see them. While in Grahamstown, we stayed at uMariya uMama weThemba Monastery, the Anglican Benedictine monastery where Travis lives and works. This has become one of my favorite places to share time and space since I've been here, and I was happy to back. Saturday Ann, Amanda, and I spent the day at Pumba Game Reserve while Travis stayed to do some work at the monastery. There we saw lots of animals including a rhino, lions, hippos, giraffe, and the significantly smaller, yet equally impressive, bat-earred fox. Saturday evening we attended a vigils service in the chapel with the brothers, and enjoyed some Thai food in town for our last dinner all together. Sunday morning we went to eucharist in the chapel, which was a great way to spend our last morning together. There, much hope and joy was shared. Travis preached that morning, and we were able to spend time after the service mingling with the monks and children from the area who Travis with whom spends his days. From there Amanda, Ann, and I sadly said our goodbyes as we continued on to Mthatha, while Travis stayed on in Grahamstown. We wound our way through the curves of the N2 that lead into the Transkei. The drive from Grahamstown to Mthatha, which at times can be hair-raising because of the occasional stray cow or goat combined with narrow and winding roads, is my favorite. The rolling hills of this section of the Eastern Cape are dotted with brightly painted rondavels that seem to pop up out of the tall grass and vertical landscape. We made it safely to my home in rondavel number one at Bedford Hospital, and settled into dinner with Megan my friend, neighbor, and fellow volunteer extraordinaire. The next morning we had Thanksgiving in May! What better time to watch the Macy's Thanksgiving Day Parade than May 2nd? This is a Turkey Day morning tradition at my house, and my mom had been wonderful to record it for me back in November. However, when the disc made its way to South Africa in early January, it was the middle of summer here, and that is no time to watch Matt Lauer, Meredith, and Al bundled up in Herald Square. So, since the cool weather had set in by May and with friends around, we nestled in for a breakfast feast (complete with festive turkey paper plates) to the sights and sounds of parade joy! We then spent the rest of the day exploring Mthatha. Monday was a public holiday and Itipini Community Project was closed, but we stopped by for a visit and I was able to share some of what my days here are like with Ann and Amanda. It was fun and exciting being able to show them around a place that has really become my home. They were able to meet some of the friends I've made over these months, and see important places that continue to shape my time here. It was a full day, and one for which I am very thankful. So maybe that whole Thanksgiving in May deal really was appropriate? Tuesday morning I headed back to work, while Amanda and Ann set off for their flight home. It was hard seeing them go, and to see such a week come to an end. I'm so happy and thankful Team South Africa had this time to spend together. We were able to get to know each other better, see much of this beautiful country, share parts of our respective communities with one another, and of course, listen to some pretty great music along the way. Last week many of the kiddos were on a school holiday, and in an effort to keep them interested and occupied we had a couple of game days. Mostly it was slightly organized chaos, but in the end, I think everyone had a good time. The trusty egg-n-spoon race was a crowd favorite. Suspense, the thrill of victory, the agony of defeat/having egg splatter on your feet--this game really has it all. Limbo, water relay games, and a new twist on bobbing for apples that involved tangerines were also part of the festivities. 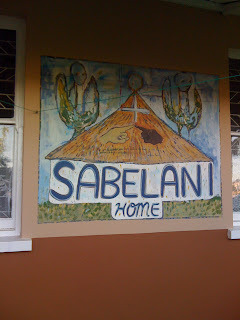 I also wanted to elaborate a little more on Sabelani Home, which I referenced in an earlier post. Sabelani has become one of my favorite places to spend time here in Mthatha. It is home to eleven young men and Father Guy, a Catholic priest and all around wonderful man who started the project over a decade ago. 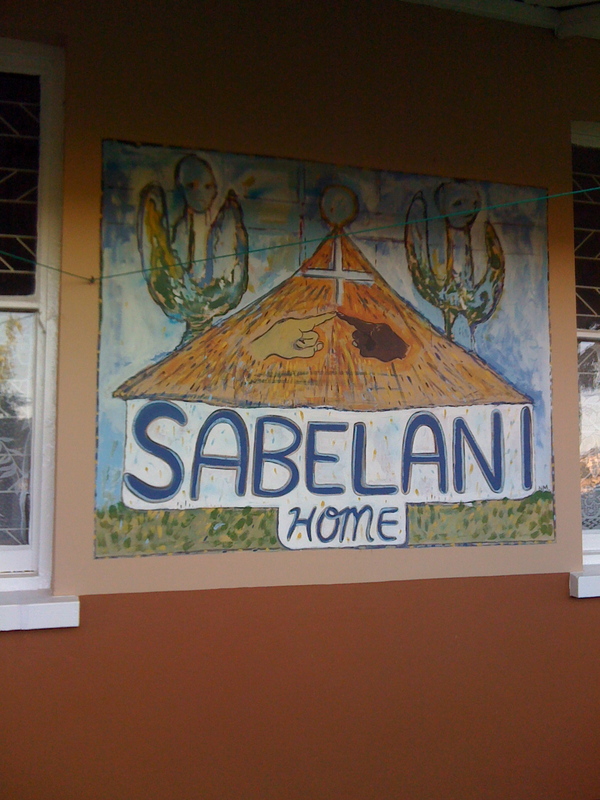 Sabelani, a name which implies a response to being called or spoken to, provides resources for low income boys and young men who want to further their education. Some live in the house and others receive monetary support, but all must be committed to further learning. Getting to know the guys, laughing with them, hearing pieces of their individual stories, and seeing how they live together in community to support one another has been great. Father Guy and Boyi-Boyi hang some laundry in the backyard, while Megan and I provide moral support. 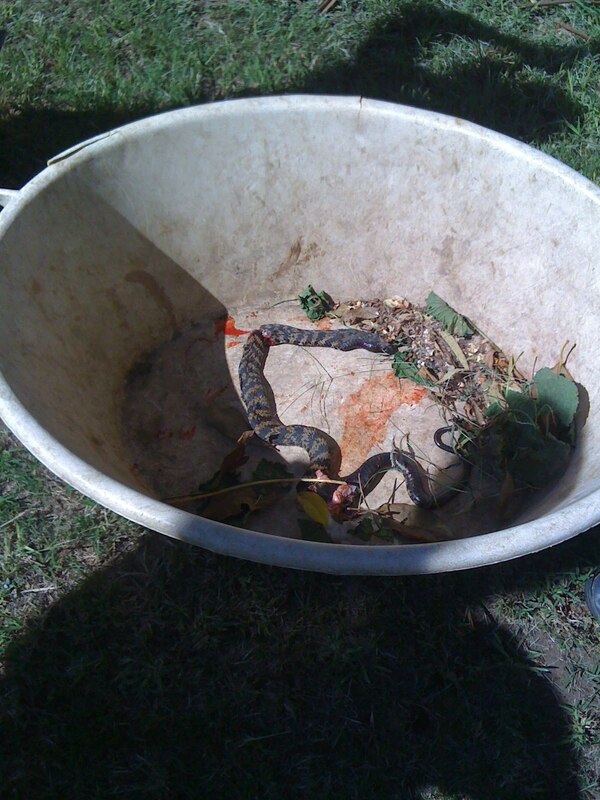 Annnd finally, I have to share a story from this past weekend that involves an unexpected visitor. Megan and I were enjoying a quiet and laid back Saturday morning, when all of the sudden we discovered a cobra had found its way into our hallway. Megan heard the snake slither and then saw it do its eerie cobra-head-raised thing, and ran back into my side of the house. We isolated the snake to the hallway and then enlisted the help of our neighbors Georgio and Sabra (aka Cobra Dundee and Sabra the Snake Scooper). 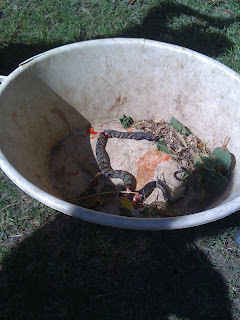 Having had their fair share of snake encounters, they grabbed a hoe, pitchfork, and giant bucket to ward off the unwelcome guest. On Monday evening our friend Sipho passed away. Sipho was a father, a husband, and a man with a gentle spirit. His name means “gift,” and he was just that for me and others who knew him. Sipho was living with HIV (and, in his case, TB, oral thrush, wasting disease, dehydration, and probably esophageal cancer). His wife Pamela is also HIV positive and has Multi Drug Resistant TB. Megan and I spent most of the day Monday with Sipho at Ngangelizwe Clinic pleading with nurses and doctors to help rehydrate him and make a plan for further treatment. We ended up seeing a kind doctor who gave Sipho a liter of fluid and us instructions to run further tests in the coming days. Jenny picked Sipho up from the clinic and drove him home. He insisted on walking up to his tin house, painted a pale pink, that sits on the edge of a hill beside the clinic. Jenny received a call from his oldest child at around six in the evening, in the middle of a torrential rainstorm, to say that he was gone. Sipho’s partner Pamela, and his three children have also come to mean a great deal to me as I’ve gotten to know them through the clinic and tutoring after school. They have lost a significant piece of their family, and the larger community feels that loss as well. I am struggling to reconcile my feelings surrounding this loss and the awful pain and hunger Sipho felt in the days and weeks before his death. A new friend, Mary-Ann Carpenter, shared this prayer with Megan and me Saturday evening while we were in Durban last weekend. The Carpenter family is a living example of how reconciliation and beauty can come out of brokenness and despair. It has come to mind many times this week. We struggle, we grow weary, we grow tired. We are exhausted, we are distressed, we despair. We give up, we fall down, we let go. We are empty, we grow calm, we are ready. A small, shy truth arrives. Arrives from without and within. Arrives and is born. Simple, steady, clear. Like a mirror, like a bell, like a flame. Like rain in summer. A precious truth arrives and is born within us. Within our emptiness. We accept it, we observe it, we absorb it. We surrender to our bare truth. We are nourished, we are changed, we are blessed. We rise up. Just before I left for Mthatha, I sat down for dinner with both of my parents at our kitchen table that has the giant legs which make for excellent footrests and the worn spots on its center from years of dishes being placed upon its grain. That table has been my kitchen table for all twenty-three years of my life, and gathered around it were the two most important people to me. We sat and ate and talked like we had many times before when I was younger, and honestly there was no better way for me to spend my time before leaving. A meal shared together was one of our last acts as a family before my year in South Africa began. In thinking back over these seven months, meals shared together stand out as a theme. Whether it be lasagna night at Jenny's on Wednesday, lunch on a hot Sunday afternoon in a one room church, gathered around a table with eleven of the most remarkable young men I've met at Sabelani Home, or a braai (Afrikaans term for a BBQ) with other volunteers as a storm rolls in, these times shared together stand out. Here I feel nourished both my the food we consume, but also by the conversations that unfold. Around these tables of various shapes and sizes, there is time to decompress, to laugh, to share, and to learn a new part of someone's story. These are moments of transparent time. "A sacrament is when something holy happens. It is transparent time, time which you can see through to something deep inside time....Needless to say, church isn't the only place where the holy happens. Sacramental moments can occur at any moment, any place, and to anybody. Watching something get born. Making love. A high school graduation. Somebody coming to see you when you are sick. A meal with people you love. Looking into a stranger's eyes and finding out he's not a stranger. If we weren't blind as bats, we might see that life itself is sacramental." I am so thankful for the two weeks I was able to spend in the "Mother City" of Cape Town. Being able to share Christmas and celebrate the start of the New Year with good friends was truly wonderful. Amanda and Ann who are YASCers in Cape Town were gracious hosts and great tour guides to Jessie, who flew down from her YASC post in Maseno, Kenya, and myself. I arrived on the 23rd, just in time for Christmas Eve preparations and to share the holiday cheer in a new place with some familiar faces. We had a tasty and unique Christmas Eve experience when Mari, one Amanda’s co-workers at HOPE Africa, invited us over for a traditional Finnish meal. We shared some delicious food, danced, swapped gifts, and laughed a lot. Then we journeyed over to the St. George’s Cathedral for their midnight mass. Sitting there as the service started, I couldn’t help but miss my family and the late night service that would be taking place a few hours from then at St. Paul’s in Chattanooga. This was my first Christmas away from my homes in Chattanooga, Los Angeles, and Sewanee, and I felt the absence of the traditions that each place holds. However, I realized sitting there in the candlelit darkness of St. George’s and singing “O Come, All Ye Faithful,” what a truly a miraculous event we were celebrating in community worldwide in a way that I never have before. We all spent the night in the cozy home of Rev. Suzanne Peterson (and her wonderful pup Thembi) who has been living and working in South Africa for over a decade. Her house became holiday central on Christmas Day. We spent most of the day cooking, eating Jessie’s monkey bread, listening to music, trying to master the paddle ball that Amanda’s mom sent to her, and just being together. My role in all of the cooking was mainly to chop this or wash that, so I can’t really take much credit, but we ended up with quite a feast for Christmas dinner with Ann’s leg of lamb as our center piece (check out the picture from my last post to see more of our delicious spread). The rest of our time together in Cape Town was spent exploring and sharing with one another. One of our first adventures was to the top of Table Mountain via the cable cars on a very windy day. We also made our way out to Boulder’s Beach where we could hang out with some penguins, and dip our toes into the verrrry chilly waters. Wine tasting was also a must, and a fun evening out with the staff of HOPE Africa made for many memories including a midnight visit to Clifton Beach. We also ventured to the Castle of Good Hope and the District Six Museum, which the history nerd in me loved. The District Six Museum stood out especially as a place where stories are preserved, honored, and shared in a very community driven way. I appreciated this and how it pushed me to think about memory, storytelling, and the power of the human voice in new ways. Our time together also allowed us to share our stories with one another and talk about where our journeys this year are taking us. I felt so much joy being there with Jessie, Amanda, and Ann. Ringing in 2011 with these amazing young women will not be forgotten, and I’m so grateful we had the opportunity to share this time together. Flying back to Mthatha, I was filled with happiness both from the memories of Cape Town, but also in feeling that I was coming a home. I was coming back to people and places that are no longer so new and unfamiliar. Getting out of the truck on our first day back at Itipini, I was greeted by Wee Mama, who has one of the best smiles, and engulfed by a big hug and “Molo Sarah! Unjani?” (“Hello Sarah! How are you?”). I was happy to be back and hear how everyone was doing. It was good to see the kids and some of our regulars in the clinic. My first day back and these first few weeks since our holiday break have such a different feel to them than my first days in Itipini. I’m so very glad to be back. School started last week, and a lot of our time has been spent helping sort out their registration fees and paperwork. It’s a busy time, and I’ll have more to share soon. Thanks for reading, and let us walk together. p.s. To learn more about what Amanda, Ann, and Jessie are doing in Cape Town and Maseno, please click on their names and you’ll be taken to their blogs.